At Compliance Poster Company, we are committed to improving our environment to create a cleaner tomorrow. We strive to ensure that our clean printing processes comply with or exceed Federal EPA standards. Did you know that recycling paper results in 35% less water pollution and 74% less air pollution when compared to producing virgin paper? Recycling also helps preserve our forests, minimize landfill composition, and actually costs less resulting in savings that we are able to pass on to you. These are just a few of the reasons why CPC uses recycled paper, both for our posters and in our operations. In addition, our on-demand production methods allow us to produce only what is needed for immediate shipment. To further reduce waste, we developed the innovative Peel ‘N Post overlay sticker that enables you to update a single notice on your existing poster without having to replace the entire poster. All printing facilities require power to operate but eco-friendly printing facilities consume significantly energy. CPC uses energy efficient state of the art equipment that reduces machine and air cooling resulting in substantial energy savings. 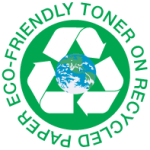 Plus, the toner cartridges we use do not require any chemical manufacturing resulting in further savings. And unlike petroleum-based inks, toner cartridges require no special ventilation, toxic solvents, or fireproof containers. To learn more about our eco-friendly labor law posters, contact the CPC Compliance Team today at 1-800-817-7678.